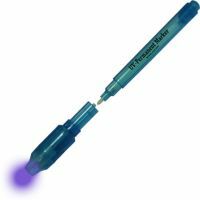 UV Marker - permanent marker met ook een UV-Led. Artikel is geschikt om diefstalgevoelige artikelen met een tekst te markeren, welke onder UV licht zichtbaar is. Write your name or stocktaking number direct on the product and make it visible with the UV LED or with an UV lamp. Of course you can use the UV LED also for making the UV particles on banknotes visible. Please note that the CCE 805 is only a simple tool for a fast check of banknotes and does not provide 100% security, such as professional electronic tester (e.g., CCE 110 or CCE 112 series). The counterfeiters are able to produce and prepare counterfeited banknotes in that way, that the pen can’t detect them.